Restoring the gardens to the "heart of the community" will be a legacy for future generations, David Auton, Chair of South Cliff Community Group. Scarborough Borough Council has been awarded a grant towards the cost of a project to restore and improve the historic South Cliff Gardens. The Heritage Lottery Fund (HLF) and the Big Lottery Fund has awarded a £4,665,700 grant for the project which will benefit current and future generations. The National Lottery money will now be added to funds already raised by the local South Cliff community for the Saving South Cliff Gardens project. more than one hundred years ago. The local community has worked tirelessly with the council’s consultants, Southern Green, and the council’s project officer to get the project plans and funding to an advanced stage, including raising more than £100,000 from local pledges. David Auton, Chair of South Cliff Community Group, said: “Our members have given hundreds of hours of their time to organise and run a campaign that raised £112,000 in pledges in just a few weeks; they demonstrated the commitment of the community. I have been overwhelmed by the passion of our members and the broader community to see the gardens both restored to their former glory, and to be developed in a way that will delight residents and visitors to Scarborough. Speaking about the successful National Lottery funding bid, Cllr Derek Bastiman, Leader of Scarborough Borough Council said: “It really is fantastic news and is a tribute to the dedication of the Chair of the South Cliff Community group, David Auton, group members and the wider community. The aim is for the project to get underway in March 2020 and be completed by the end of March 2021. There will also be an annual programme of exciting and inclusive events put on for the local community and Scarborough’s visitors to enjoy. Cllr Tom Fox, Weaponness ward councillor and Cllr Mark Vasey, Ramshill ward councillor, who represent the communities in and around the South Cliff, said: “The commitment from the South Cliff community has been outstanding and we would like to thank them for their generosity in giving time, expertise, hard work and financial contributions to this very worthy project. Supported by the National Lottery funding, the new Operational Centre will be used to help deliver 53 training activities for existing and new staff, which will include a Horticultural Apprentice, and train 200 volunteers. There will be a structured programme of volunteer participation, which will include developing new partnerships with organisations such as the First Light Trust and the Refugee Council. Speaking on behalf of the Heritage Lottery Fund and the Big Lottery Fund, David Renwick, Head of HLF Yorkshire and Humber, said: “South Cliff Gardens have a wonderful history and now have a brighter future thanks to National Lottery funding. Not only have they always brought vital health and wellbeing benefits to Scarborough, but their appeal reaches to holidaymakers across the UK. Once at the heart of Scarborough’s seaside resort; the South Cliff Gardens were the place to go to improve health and wellbeing, socialise, explore and enjoy the extensive and stunning sea views. The gardens include 14 timber and concrete shelters, perhaps the largest number of historic shelters in any public garden in the country and feature 19th Century Egyptian gates, Italian steps designed by Joseph Paxton, iconic Italian gardens, the first funicular railway in the country, Holbeck Clock Tower, the world’s first beach chalets, rose garden and the much loved Clock Café. 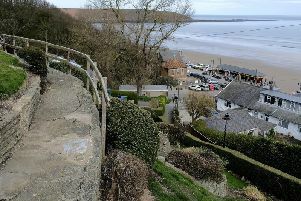 The South Cliff Gardens and Scarborough Spa were at the forefront of the development of the town and by the 19th century there was a saying - The Spaw is Scarborough and Scarborough is The Spaw - that demonstrated the enormous economic importance of The Spa to the town. South Bay, the area in which they are located, is recognised by Historic England as the country’s first seaside holiday resort. The gardens also offer great natural heritage value in their mosaic of habitats and function as a wildlife corridor and buffer between the town and natural cliff slopes to the south. Research at the North Yorkshire County Council Records Office and consultation with local people, especially fishermen, has revealed unexpected stories such as the discovery of the previously unknown White House that stood on the cliff face above where the much loved Clock Cafe now stands. The White House was used as a guiding point for sailors to keep them safe as they returned home from sea.